It is relatively rare to have the first term sought (the axis term) on a matrix to be more than 8 letters. On this matrix it is 9 letters, the word for AIRLINE. The second term sought was Christmas, in reference to the Christmas Day, 2009 attempted bombing of Northwest Airlines Flight 253. The Hebrew for Christmas is pronounced Chag (holiday) Ha (the) Molad (Nativity). It requires 7 letters for all three components, but Nativity (Molad) is just four. On this matrix, NATIVITY at skip 4075 is in direct (but inverted) sequence with AIRLINE at skip -4075. It is very unusual for such a key word to combine with an axis term in this way to get a 13-letter ELS. Next the year was sought. It (5770/2009) is present parallel to the axis term in the first column to the right of the axis term. It requires only 38 letters to show AIRLINE, NATIVITY, and5770. The word BIRD crosses AIRLINE in the open text and, of course, some people refer to an aircraft as a bird. But BIRD was not an a priori key word, so no statistical significance is attached to it. The next word sought was TERROR. The first Hebrew synonym, a transliteration from the English, was not found, but a synonym was located. Finally, a term was sought to indicate that the flight was not blown up (due to a miraculous malfunction of the explosive device). The word for SAFETY was discovered, again parallel to the axis term. 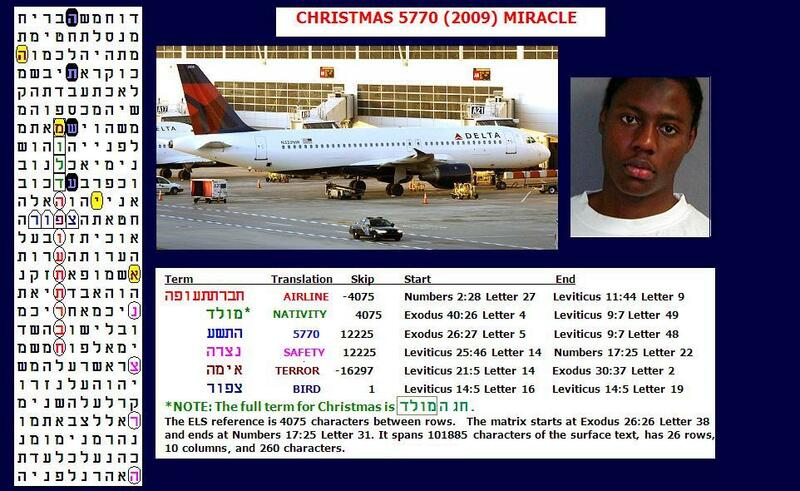 The initial combined p value for AIRLINE, NATIVITY, TERROR, SAFETY, and 5770 was about .00052 (one chance in 1,917), but this is somewhat deceiving because there were words sought but not found on the matrix including the bomber's name, Northwest, Delta, and the flight number. As expected, the word NATIVITY at a special case skip (axis term skip, +1, or -1) was the most significant key word, (p = 0.019) while it was a virtual certainty (p = 0.89) that one of the words on the CodeFinder dictionary for TERROR would be there somewhere. Also see a related discussion of Christmas 2009.